My first job on an animated film (composing and producing the soundtrack) came right out of college, when my friend Alan Goodman introduced me to David Bruce, a student filmmaker. 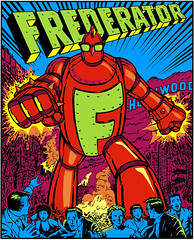 Looking back over the 1000 films since (commercials and network identifications for MTV, Nickelodeon, Lifetime, and Comedy Central, cartoons for Hanna-Barbera, Nickelodeon, and Frederator) it occurred to me that most of the filmmakers were virtually first-timers, and the thrill of discovery was a great part of the excitement. That's why it was a dream come true for Frederator Studios to create a brand new film festival for the wildly successful new Nicktoons digital channel. The Nicktoons Film Festival has its first week's screening Sunday night at 10pm EST. The festival has received an overwhelming response from filmmakers all around the world. We received over 400 films, and festival programmers Eric Homan and Rita Street guided our co-producers from Animation Magazine to narrow the field to almost 100 animations. Over the next 4 months our esteemed judges Gabor Csupo, John Kricfalusi, and Eric Goldberg will pick the $10,000 Grand Prize Winner. I hope you enjoy discovering these new animated filmmakers as much as we do (and if you're convinced one of them's going to be a big hit, let me know so we can sign them up).